Everybody loves Honeybells! We call them "Honeybellicious" because they are so good! They're the juiciest too. Honeybells are in season each January. If you love oranges, and if you adore tangelos, then you will marvel at the Honeybell. A distinctive tangelo fruit, this rare hybrid is the sweetest and juiciest orange you will ever eat. So rare, in fact, that only a handful of Florida growers are able to produce this delectable fruit, which only grows along the Indian River. 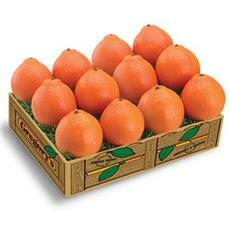 Born from an ingenious idea to take clippings from a Dancy Tangerine and a Duncan Grapefruit Tree, and set them to grow inside of a young orange tree trunk, Honeybell Tangelos are a unique tangelo fruit hybrid that is hard to compare to other orange-like fruits. 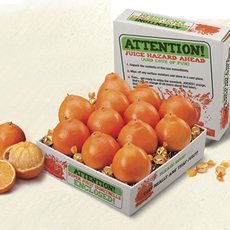 Featuring a fiery red color, its unique blend of sweetness and juice offers a burst of flavor that is unmatched amongst other Florida Citrus offerings. Available only for a few weeks in January, the Honeybell isn't always easy to find. Not widely available, it has been estimated that only 1 in every 5,000 people will ever experience the pure joy of biting into one of these scrumptious treats. 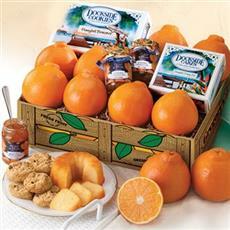 Gregory's Groves is proud to offer sweet and juicy Honeybell Tangelos to our collection of delicious citrus offerings. Grown in our orchards with the utmost of care, they are cut from our trees (yes, cut, not picked) in order to preserve the tender fruit and flavor. Our Honeybell collection can be ordered prior to harvest to ensure that you can indeed get - and enjoy - a taste of this sweet treat. 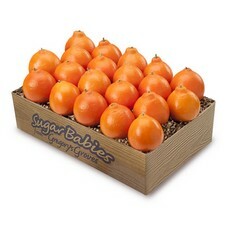 Honeybells: Our most popular citrus product, this is the standard amongst Honeybell fruit. 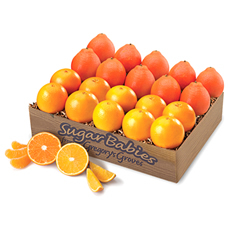 Sugar Baby Honeybells: smaller than their big sister, Baby Honeybells are just as sweet. 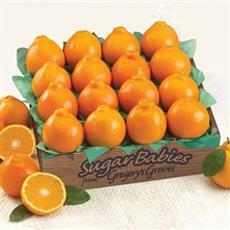 Super Juicy Honeybells: The sweetest and juiciest Honeybells Florida has to offer, you won't want to bite into one of these without donning the bib enclosed with every box! If you have ever tasted a Honeybell you know how good they are - and how difficult they can be to get your hands on. So be sure to order early! Supplies are limited. Our friendly customer service representatives are ready to help you find just what you are looking for. Whether it is a delicious box of our famed Honeybells for yourself or a gift basket of favorite treats for someone you love, let us guide your citrus buying decision. We are always ready to lend a hand and explain our products and we always guarantee that our fruit is the freshest and most delicious you will find anywhere!